One of the first DJs to play Elvis, Buddy Holly, and other rock n’ roll acts regularly in Canada, Red Robinson is a Vancouver radio star who was extremely popular with young people. He went on to have a very successful radio and TV career while authoring a couple of books along the way. I’m sure some people attending Red Rock Diner remember the days when Robinson dominated the airwaves, and this show is a nostalgic trip back to those days. It’s full of toe-tapping classic ’50s music, but it’s lacking a strong narrative. Act one is a collection of songs with interludes of Robinson’s DJ antics, and I found myself waiting for the show to give me some kind of plot. A few songs in, I realised that there wasn’t going to be much of a plot and accepted the fact that this show would be a series of loosely strung together songs set in a diner. This doesn’t mean the show wasn’t entertaining. I enjoyed the music and the infectious dancing of the extremely talented cast, and although I wasn’t around when these songs were being played on the radio, they still retain a certain charm. Songs such as “Rockin’ Robin” and “Jailhouse Rock” stuck with me for days afterwards, but I’m not sure that’s a good thing. Being set in Vancouver, there were plenty of stereotypical references to the city. Of course the weather report was all rain, the Canucks had just lost their latest game, and there were crowds of teenagers at English Bay. Robinson’s reaction to the price of houses in Kitsilano at $15,000 got a few laughs, and they even managed to fit in a dig at Whalley that fell quite flat. Other timely references include some advertisements of that era, such as 7-Up and Buick. The five-piece band really knows how to rock and gets to show their skills on tracks such as “Great Balls of Fire,” “Rock Around the Clock,” and “Good Golly Miss Molly.” The four main characters, if we want to call them that, are impressive with their smooth moves and stamina throughout the show, but some of the choreography felt a bit forced and not so rock n’ roll. With very little plot to work with, the show relies on audience participation for their series of songs with female names in the titles. As they began singing “Jenny, Jenny” they invited any Jennys to the stage. Same for “Diana,” “Oh, Donna,” and “Wake Up Little Susie.” Once all the audience members were on stage, they participated in a musical chairs competition, and while this was mildly entertaining, it detracted from the show and I would have preferred to see another song or two performed by the cast. Displayed on a screen above the stage as the audience enters the theatre is Edward Hopper’s Nighthawks. While it is a painting depicting a diner scene, I wasn’t sure how it fit with the themes of the show, and I think that it evokes many more deep emotions than Red Rock Diner. For an entertaining evening that will be pleasant for all ages, this show is a success, but as a piece of profound theatre, it has some work to do. 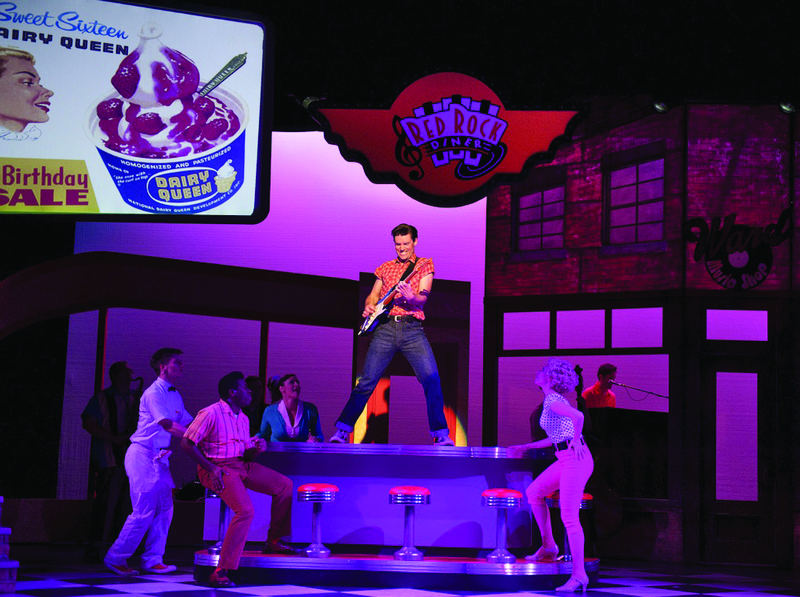 Red Rock Diner runs from June 25 to August 2 at Arts Club Theatre’s Granville Island Stage. For more information, visit artsclub.com.